Many of us wonder what editors mean when they refer to a "literary mystery." 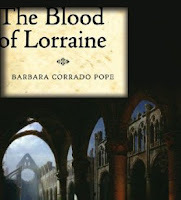 Barbara Corrado Pope's historical mysteries featuring magistrate Bernard Martin are excellent examples. The first novel in the series, "Cezanne’s Quarry," it was one of five finalists for the 2009 Oregon Book Award’s Ken Kesey Award for Fiction. The second in the series, "The Blood of Lorraine" (Pegasus), set in Northeastern France in the final years of the 19th century, finds magistrate Bernard Martin reluctantly accepting the case of a couple who claim that their infant son was ritually killed by a Jew — a tragedy that ominously echoes the Dreyfus Case, a real-life incident involving the anti-Semitic persecution of a distinguished soldier. 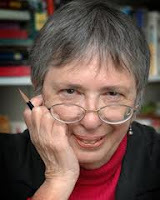 JRW: Barbara, you are a historian the founding director of Women’s and Gender Studies at the University of Oregon, what drew you to writing mysteries? Barbara: I always thought I would eventually write and try to publish fiction, but I did not conceive of myself as a mystery writer, even though I love them. Most of my attempts at short stories were along the line of contemporary satire. Then one day an old friend wrote about the five projects she was going to pursue during her sabbatical, one of which was to write a mystery about "Cezanne, Provence and geology." I thought this was a terrific idea, and I encouraged her to drop everything else and pursue it. We even thought of writing the novel together. But within the year it became obvious that, although she is brilliant and imaginative, she did not have the patience to write fiction. In the meantime, I had begun to think about that old saw "write about what you know" in a new way. I'm a lover of art and a French historian, and I've lived and taught in Provence. I came to the conclusion that "Cezanne, Provence and geology" is something I know. I'm glad to report too, that my friend, Roberta, is thrilled that I went with her inspiration. She, incidentally, would have written more of a "cozy" with Cezanne's unhappy mistress as the detective. I went for the more traditional policier approach. JRW: Roberta sounds like a generous soul. What was the most surprising thing that happened to you after you published your first novel? JRW: The backdrop is the Dreyfus Affair. Magistrate Bernard Martin has moved from Aix-en-Provence to Nancy, awaiting the birth of his first child, when an infant is found dead, and its mother insists it was killed by a wandering Jew in an act of “ritual sacrifice.” Did you know who the killer was before you started writing? Barbara: Yes, I knew who the killer was going to be, but I didn't know much about him. I think that one of the advantages of writing mystery is that you do know the endpoint, and you can sketch out a road to getting there. I'm not a fan of mysteries in which someone unexpectedly confesses all, and I do mean all, tying every loose end together. I like the solution to be built into the novel. JRW: Your novels tell a riveting story, but they also explore issues and questions that concern us today. What issues were you looking at in this new novel? Barbara: Initially my agent had suggested that I write a series. I hadn't really thought about that when I wrote Cezanne's Quarry. That that book began with a theme: Cezanne, Provence and Geology, and then morphed into other themes: science and religion, the condition of women. So as I began to think about the second novel, I asked myself what theme would be compelling for me as a writer. I decided: racism and prejudice. (After all, I had taught these issues for years.) Anti-Semitism was the racism of 19th-century Europe. What deepens the novel, I think, is how it deals with questions of identity and assimilation. JRW: How did you make the transition from nonfiction to fiction? BCP: Good question! As an academic writer I tried to be clear and concise. In writing fiction, I had to learn to elaborate, to make room for ambiguity. The other issue that is salient to me as an historian is how to give the reader enough information (in a graceful way, of course) without giving too much. One of the lessons I learned from reading John LeCarre is that every description should also convey a mood. I strive to do that. JRW: Do you think there are things you can do more effectively in fiction than in nonfiction? Barbara: How about getting people to read to the end and not stop a the footnotes! I'm kidding a little here, of course. I think one really succeeds as a fiction writer if people identify with your characters. And if they do, if there is something you are trying to convey, like what it was like to be a secularizing Jew ca. 1894, then they will broaden their understanding of what I will pretentiously call the human condition in other contexts. JRW: And what are you working on now? BCP: I'm in Paris at the moment getting to know the sites of novel that will be the third (and I think last) Martin mystery. Clarie will take center stage this time. At first I thought that I'd place her story in the context of the women's movement, since that is something I really do know. Somehow this theme did not fire up any satisfying plot lines. So we'll have strong women (proto-feminists), anarchists, immigrants, and danger. I realize that one of the themes that will always appear in my writing is social class. It will be highlighted in this novel too. We took an apartment in "unfashionable" but very practical Paris because it is three blocks from Clarie's school (which is still functioning). I've fanned out from there to find a residence, parks, entertainment, transportation, and workplaces for the Martins. I plan to bring them to life again very soon. JRW: Thanks, Barbara! A pleasure to have you visit Jungle Red. Barbara will be checking in today, so please, join the conversation. I don't understand what makes people call her mystery novels "literary?" That's a tough question to answer. I think very few writers would refer to themselves as writers of "literary mysteries' - Barbara doesn't use it. She even says another writer might have taken the same material and gone down a cozier path. I think it's a term editors use to drive the rest of us crazy. No, Barbara never called her novel "literary" - I did, on the strength of it being a finalist for the Oregon Book Award. Not too many genre novels get on lists like that. The term 'literary mystery' has come up at several mystery conferences I've been to... mostly from writers wondering what one would look like because they've heard that publishers are looking for them. I think it translates to a novel that is well written with strong, nuanced characters, and that has at its core the exploration of an important issue. Thanks Hallie, In trying to define what a literary mystery is, you have put together all of the aspects of writing that I strive for. All of which is more important than a label, like literary. And I do agree with Rosemary Harris, that sometimes these labels are employed by editors and agents to drive us all a little crazy. Oh, making room for ambiguity.